I’m a big football buff! And what food goes best with gameday? Chili, of course. I’ve created one that’ll be sure to please every palate. It’s vegan … but you may not want to tell the guys beforehand! You can certainly serve it up with sour cream and Monterey Jack or Cheddar cheese. But do try it without. I think you’ll find this intriguing chili—with the surprise additions of butternut squash and pumpkin pie spice—doesn’t need to be over-accessorized. The creamy avocado on top is a perfect finish. I love this recipe. Hope you do, too. Please let me know what you think! Heat the oil in a large saucepan over medium-high heat. Add the onion, bell pepper, and jalapeño and sauté until the onion is lightly caramelized, about 8 minutes. Add the garlic and sauté for 30 seconds. Add the broth, vinegar, tomatoes, butternut squash, chili powder, pumpkin pie spice, and salt and bring to a boil over high heat. Reduce heat to low, cover, and simmer until all vegetables are softened, about 25 minutes. Stir in the beans and simmer uncovered over low heat, stirring occasionally, until desired consistency, about 10 minutes. Stir in the chopped cilantro and adjust seasoning. Transfer to individual bowls, top with the avocado and cilantro sprigs, and serve. Heat the oil in a large saucepan over medium-high heat. Add the beef, onion, bell pepper, jalapeño, and garlic and sauté until the beef is cooked through and crumbled, about 7 minutes. Add the broth, Worcestershire sauce, tomatoes, chili powder, cinnamon, salt, and pepper and bring to a boil over high heat. Reduce heat to low, cover, and simmer, stirring occasionally, for 45 minutes. Stir in the beans and simmer, uncovered, over low heat, stirring occasionally, until a thick consistency, about 1 hour. Transfer to individual bowls, top with the cheese and sour cream, and serve. Add intrigue, not just “heat” to chili. Try pumpkin pie spice, Chinese five spice powder, or a combination of cinnamon and unsweetened cocoa powder. Beans are so hearty and satisfying—double them up and no meat is required. 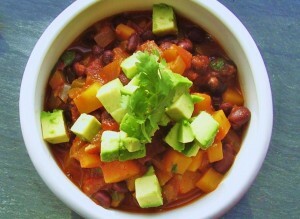 Add more volume to chili (and increase portion size!) with a seasonal veggie of choice, like butternut squash in fall or wintertime. Rethink chili toppings. Hass avocado works beautifully in place of cheese and sour cream due to its luxurious quality. So glad you think so, Bree! Thanks.